It is the metric that spans across all the digital marketing channels, the one on which all other metrics converge, the one that is most dear to marketers: ROI. First of all it is an acronym: three letters that stand for return on investment. It is the indicator that accurately measures the economic effectiveness of campaigns, offering numbers and values ​​with which to compare the effectiveness and profitability of the email channel against other digital marketing channels. ROI answers a simple and at the same time indispensable question for marketers who adopt an analytical approach to marketing strategies: how much do campaigns “make” compared to the costs incurred to implement them? A general consideration: despite the explosion of new digital technologies, the email channel continues to prove itself as the most reliable; it has registered the highest ROIs for companies and marketing professionals for years: Campaign Monitor estimates that for every dollar spent, email marketing generates 38 dollars. Although there are plenty of tools online for measuring ROI (this is just one of many), there is a rather basic formula you can use to calculate your return on investment. 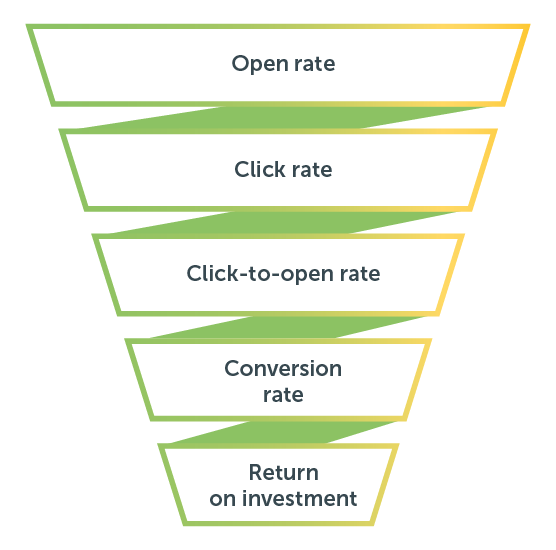 ROI is the last step of the metric funnel, the deepest level. What does this mean? Simply that optimizing ROI involves improving all the metrics at the base of the ROI: even a single flaw in one of the levels comprising the funnel brings the dispersion of resources and a lower ROI. A fitting image is that of a leaky pipe: even if your emails have an extraordinary conversion potential – thanks, let’s suppose, to unmissable offers and effective creativity – a lack of deliverability, that is, inbox delivery capacity, risks affecting the subsequent metrics with a domino effect, all the way down to the ROI. We have outlined an optimization path for each level in this blog post. It will give you a broad perspective on the macro-activity of metrics. Do You Know What Are The Most Important Email Marketing KPIs? In this post, however, we’ll focus on operations that immediately affect ROI: more precisely, we will look at some activities that affect the conversion rate and return on investment. A better ratio can be achieved between emails sent and return on investment by communications with greater relevance for recipients. Reaching every recipient’s inbox with the same, indistinct message is not enough: you need to stimulate their involvement, taking into account the interests, habits, needs, and characteristics of each individual contact. How? Through profiling, an activity that lets you convert information about the recipient into relevant and personalized emails that, according to a study by MarketingLand, have a conversion rate six times higher and a unique click rate 41% higher than non-personalized emails. What does automation have to do with optimizing the conversion rate and ROI? It’s simple: workflows, i.e. automated flows, trigger follow-up emails which match the recipient’s behavior, and are consequently more relevant and more likely to lead to a conversion. Talking about multi-channel approaches may seem out of place when discussing ROI, the KPI used to track the metrics of a particular channel. But we all know quite well that the digital world is made up of micro-conversions: small and sometimes invisible, recipients are slightly persuaded and convinced with each one. This is why a multi-channel approach, especially one in which the email and SMS channels are associated, makes it possible to trigger a step-by-step conversion process. This is very easy to do thanks to automatic workflows: choose the triggering event, select the messages, set the waiting times, and the stage is set. We are all familiar with digital advertising: we experience it every day as marketers and as consumers. Another digital advertising channel has been consolidating recently: email. It’s called email advertising, and consists of hosting banners and advertisements of third-party companies in your own emails. There is very high potential here as long you dedicate the utmost attention to the amounts of advertising in an email’s different parts, creating a balance that correctly emphasizes the advertising and is at the same time harmonious with the email’s content. For many companies (a practical example can be found in the 6sicuro case study), email advertising is a substantial channel for creating revenue, because it lets you optimize campaigns’ return on investment regardless of the sender’s contents. Also called display ads, these are nothing more than banner ads that normally include static or animated images, videos, and/or text strings which can convey a marketing message. It is the most classic format, which has more or less existed since the birth of the internet. Native advertising is intended as advertising inserts that are so in line with the content of a page, harmonized with the design, and consistent with the behavior of the platform to induce the user to think that they are an integral part of the email. This approach allows third parties to sponsor content in exchange for advertising or endorsements in your email. Sponsored content lets you maintain on-brand advertising. 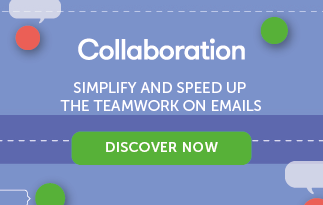 Email Marketing + Growth Hacking = Email Hacking. Perhaps the neologism is improper, but it lets us highlight the contamination between the two techniques and their potential for cross-experimentation. 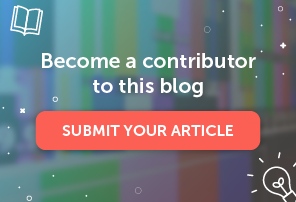 In addition to its acquisition and retention techniques, Growth Hacking becomes part of email marketing thanks to tools that let you take a new direction and give new impetus to campaigns. A useful tool can be found for each element of an email, to optimize the textual and graphic side. extremely simple and essential: in fact, it is a gallery that offers sources of inspiration from the copy of large companies like Slack and Pinterest. The absolute best catalog where you’ll find tons of email campaign models from well-known brands, divided by marketing objective, commercial sector, and touchpoints with the user. The equivalet for drip campaigns. A gallery where you can find inspiration for your email sequences: onboarding, welcome, abandoned cart, and much more. As simple as it is revealing: send your campaign to the address indicated by the tool, and you’ll instantly learn which Gmail tab your email gets sorted into. 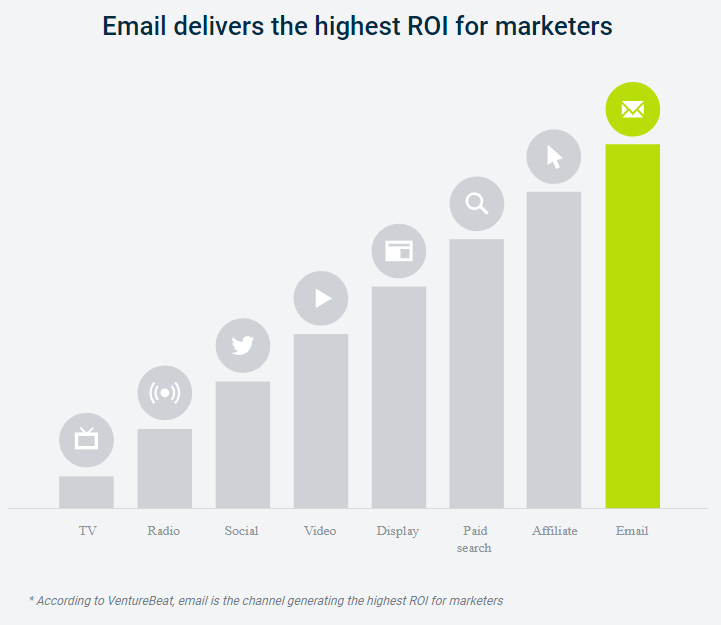 Did you get an idea of ​​what ROI means for the email marketing channel? Now it’s time to get to work. If you still aren’t familiar with the features and resources in MailUp, we suggest requesting a free trial of the platform: you have 30 days to create, send, and experiment with all it has to offer. Happy Email Marketing!